Jeff Parker and Hot Toys guest reviews go together like...well, like Mickey and Minnie Mouse, who he's looking at tonight! I'm not saying which one of them is Minnie though... Jeff is even doing something a bit different tonight, adding in the opinions of two additional guest reviewers! Take it away, Jeff, Willow and Thea! 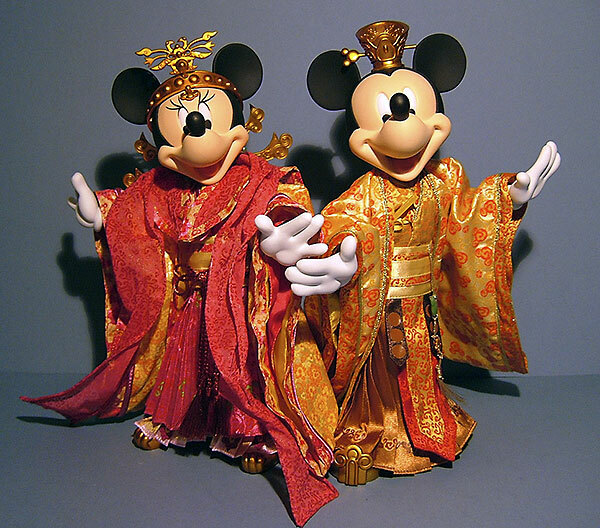 Who amongst us can honestly say we’ve never sat and wondered what Mickey and Minnie Mouse would look like if they were a Chinese Emperor and Empress… what do you mean haven’t? Well it’s been a big year for Hot Toys (HT), so we ought to indulge them; steered by Howard Chan they’ve cemented their place as the premiere producer of 1/6 figures and continue to land more and more prestigious licences. But lets not forget it’s also been one hell of a year for China, not only did they sweep the board at the most impressive Olympics ever held, as the host nation (Team UK came fourth, but hey we’re a small country…booyah, eat our wake Team Australia). It’s also been the year of the rat… sorry; I mean mouse, at least for this review anyway. 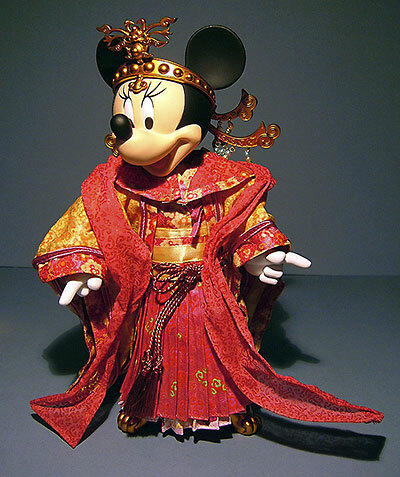 To celebrate the landing of the much-coveted Disney licence Hot Toys have released a ‘Year of the Mouse’ Cosbaby set, these two 11’ figures of Mickey and Minnie dressed as traditional Chinese nobility and another Cosbaby set featuring our Disney heroes in their more iconic outfits is planned. I’m seriously hoping the Disney licence will mean a fast track with Pixar, I’d just love to see HT give us a supper detailed WALL-E and the main players from Toy Story and The Incredibles would be pretty popular with me as well. Though these figures are strictly speaking mine, my two daughters have become their legal guardians for the time being and I thought it only fair to let them share their views (which I shall take as dictation) as well, so we can have the perspective of Thea, 4 years old and Willow, who’s 7! 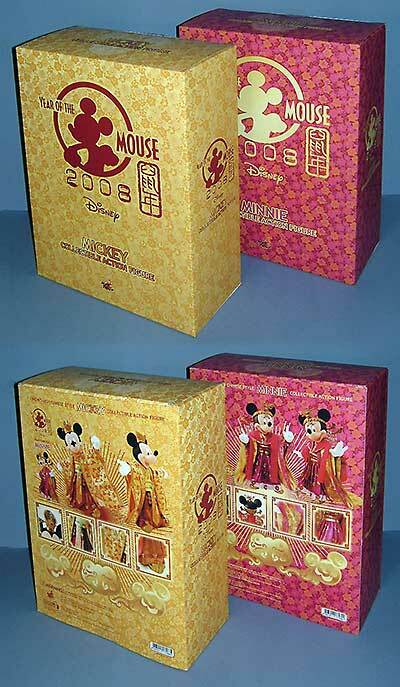 Jeff: These come in two very ‘pretty’ boxes, leading one to believe these might have more of a pull with the lady collectors (that’s not to diminish their appeal to any male Disney fans out there, merely an observation based on the packaging), they are covered in a pattern to mimic the one used on the elaborate textile of their robes, Mickey’s is a golden yellow and Minnie’s is a deep cerise. There’s no outer sleeve or indeed even a flap front. These are just straightforward boxes. The front design is mostly typographic with a Mickey Mouse 2008 logo and a description letting us know who’s inside, luckily there are also some full colour pics of the contents on the back, showing the figures in various poses with both sets of hands. Inside the box is the figure sandwiched between two formed Styrofoam trays. This is a good material for these as it holds them firmly without needing twisties and as these outfits are so elaborate, twisties would have ruined the way they hang. So in terms of protecting the contents these are a fantastic bit of packaging, but the lack of any pictures on the front hurts these a little on the shelf. Willow: I would like to have Mickey and Minnie’s faces on the front, I think they are very colourful! Thea: I don’t want them to change, I like them exactly how they are! Jeff: When it comes to sculpting characters as iconic and deeply embedded in the pop cultural psyche as these two, you had better get it right… but did you ever think HT would let us down. Both Mickey and Minnie’s heads are pretty straight forward shapes, but the proportions have been captured very accurately here, they share very similar features, but the mouth positions are slightly different and of course Minnie has her glam eyelashes. 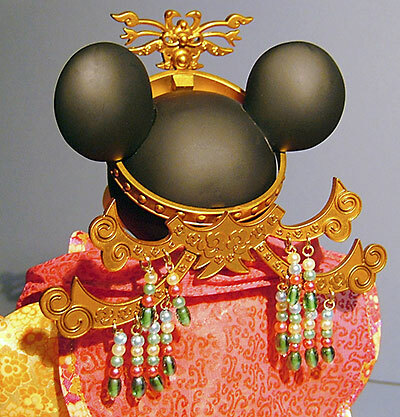 Both also have crowns, Mickey’s is smaller and worn right up on the top of his head where as Minnie’s is more of a headband with an elaborate crest with hanging jewels at the back, and a smaller ornate emblem at the front. Both crowns have lots of intricate details and symbols carved onto them. 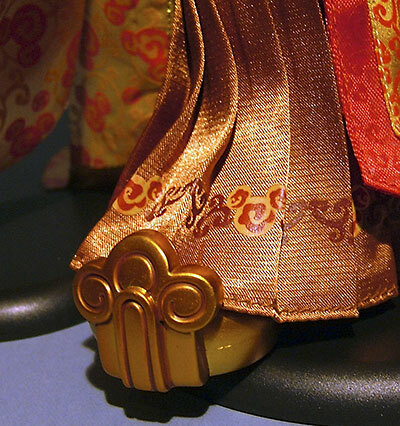 They also have two sets of hands each in the traditional three fingered Mickey gloves, and lastly they both have ornate gold shoes, these pop directly onto the ball joint at the bottom of the leg. Willow: I think they have done them really well, they look just like Minnie and Mickey, they are fantastic. I couldn’t do it that good! 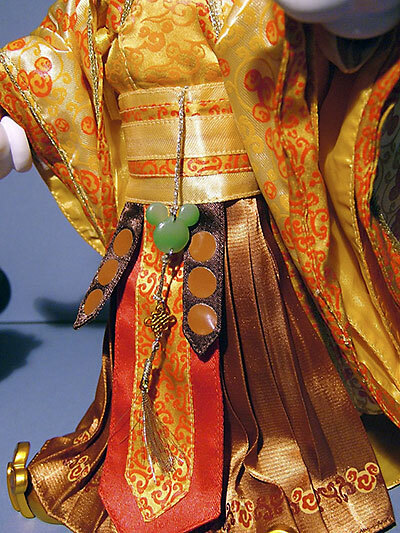 Jeff: On the whole these have a very straight forward paint job, as the lions share of the details here are in the incredible prints, weaves and brocades utilised in the complex outfits. But just because something is relatively simple doesn’t mean you should give it any less consideration. In the portrayal of two such ‘graphic’ animated characters HT have pulled off a super crisp paint job that totally does justice to them, but it’s very minimal In fact just the eyes and mouth are painted, the line between the black ears and top of the head where it meets the pink flesh tones of the face, marks where two separate pieces of plastic but up. This is a super slick job though and matches up fantastically well, as there are no signs of this being the case, no gaps or glue showing at all. In fact it wasn’t till I looked very closely that I realised this to be the case at all. Manufacturing in this way means the base plastics used is in effect the base colours needed, so with no paint the depth of tone achieved is much denser and has a nice matte/silk finish. All very well thought through and engineered. The crowns are a rich golden bronze colour and again have enough depth of colour to look natural when viewed along side the ornate outfits. Thea: What bits are painted? Jeff: A totally new body has been created for these two; it shows a great range of movement but isn’t quite up there with the True-Type, but it’s not that far off. 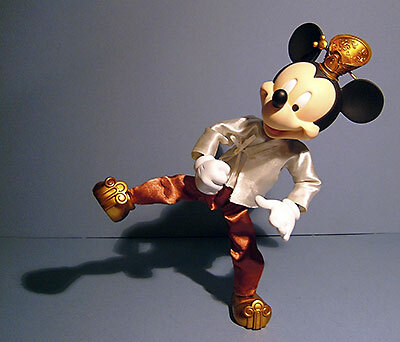 We have pop in ball joint ankles, double knees, cut thighs, ball jointed hips, a cut waist, universally jointed shoulders, cut upper arms, double elbows, pop in ball jointed wrists and a ball jointed neck, the right shoulder on Mickey isn’t as stiff as the others, but he holds poses just fine. So a great range of movement is available for some great poses. Your only limit will be the restraints of the costumes and their centre of gravity, as they both have pretty big heads, that are luckily off set by some pretty big feet. 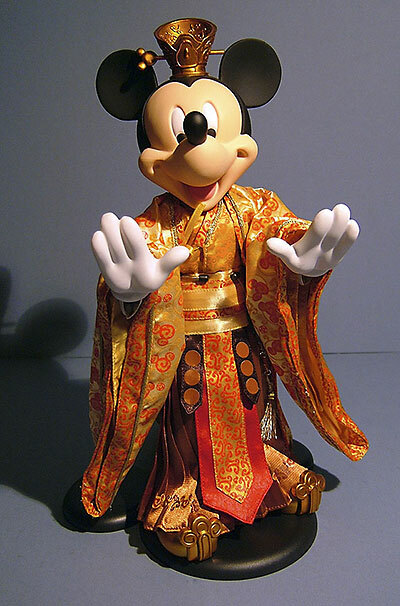 In fact, the pics I took of Mickey doing his Kung fu exercises were achieved purely using the figures ability to balance, no stands, tape or Photoshop were used! Willow: You can put them in different positions. They’re so cool! Thea: You can make them look like they are dancing! Both have an extra set of hands and a figure stand, they both come with flat open hands attached in the box, and Mickey has an extra pair of fists, while Minnie has extra pointing hands, these pop on and off easily, but if in doubt, as always apply a little heat. 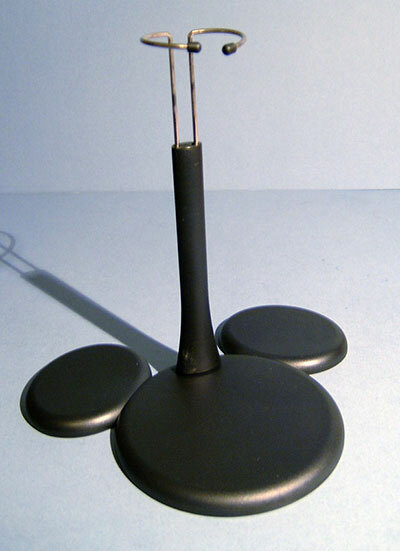 I got both of these to stand perfectly on my daughters bookcase but I’m thinking long term perhaps the stands will be a good idea, and as they are in the classic Mickey head shape they’re quite cool as well. 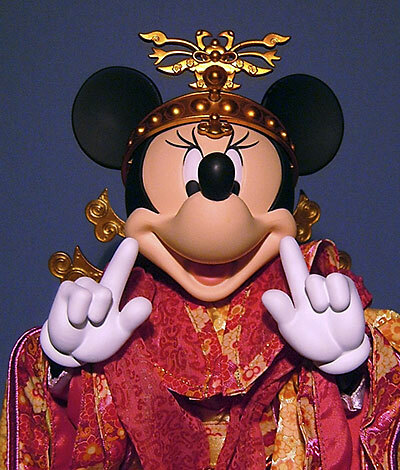 Thea: I would like a bigger crown for Mickey… more like Minnies! Jeff: The amazing outfits are without a doubt the stand out area for these figures, most of my friends and family think I’m pretty strange to not only be collecting, but also writing reviews of ‘toys’, but these characters are so firmly fixed in pop culture and have been so iconic for so many years they seem to make most people smile, and my mother in law and many of my daughters friends all want a set for themselves. I can’t wait for some of their parents to phone and ask where they can get them and how much they are … Muahahahaha! 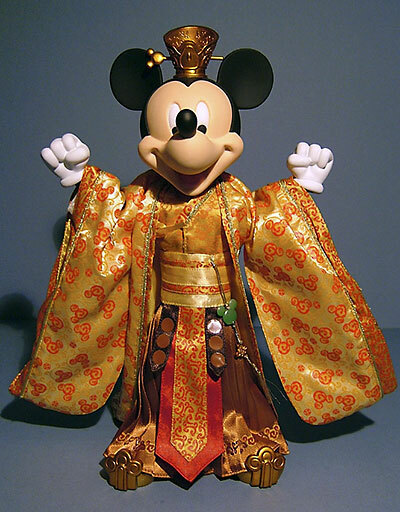 These are multi-layered and highly decorated outfits, Mickey’s is predominantly gold and has moulded shoes, trousers, a pleated over skirt, an under shirt, a wrap over angel sleeved tunic, a cummerbund at the waist with decorative sash’s hanging down and a jade style pendant on a gold lanyard with a tassel, over all this is worn an angel wing sleeved kimono style jacket. 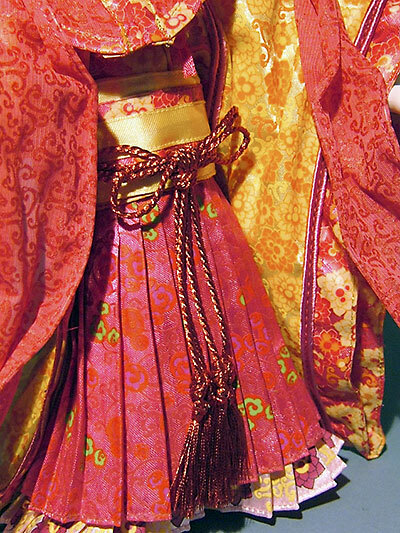 All these different garments have different finishes, patterns, edging, embroidery and brocade, absolutely amazing attention to detail. 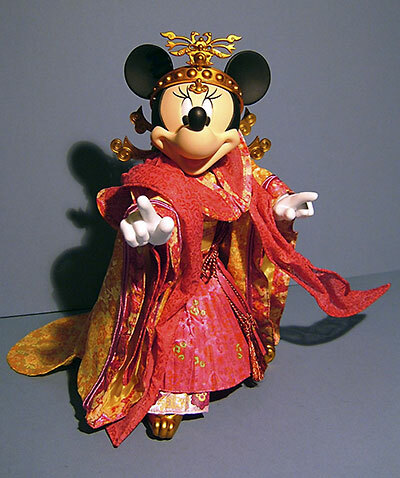 Minnie’s outfit is mostly pink and is similar in its layering, but has many differing features. 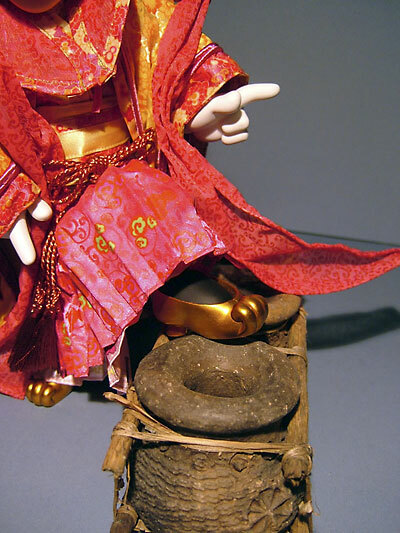 She has moulded shoes, trousers, two pleated over skirts at differing hem line lengths, an under shirt, a wrap over angel winged shirt, a cummerbund with a large ornate rope bow, an angel sleeved kimono jacket, a decorative collar/yoke and to finish it off a sheer scarf, this has wire running through its edging to aid posing. 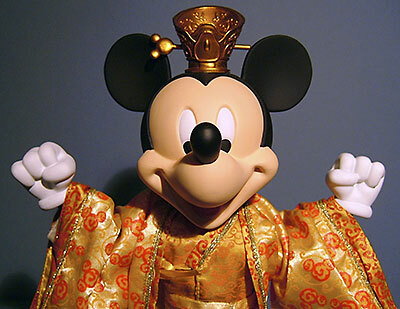 Like Mickey’s it is covered in all manner of prints, embroidery and brocade. Just beautifully tailored, absolutely has to be top marks. Willow: They both look so, so pretty. I would love an outfit like Minnies! Thea: They are a bit weird for Mickey and Minnie but I like them a lot! Jeff: These were primarily for my two daughters, and as much as they love them I don’t think playing with them would be a good idea. They both seem to be a reasonably solid construction, but when I see how much punishment their regular ‘Barbie’ sized dolls like Mulan, Snow White and Cinderella get, I’d give these guys about 24 hours. So these are again, like most of HT figures strictly for display, but they make for one hell of a nice display. Willow: I think they should just be ornaments in your bedroom or front room or any other room in your house! Thea: I would REALLY like to play with them!!! Jeff: Sideshow have these for $124 each, considering that covers the development of a new articulated body and two very unique outfits with one helluvalot of work in them it doesn’t seem too wide of the mark to me, especially when you see most eBay dealers are asking for $130 to $150. If you can find these nearer to the $100 mark I’d give top marks without a doubt. Willow: You use eBay Daddy, so I would let you get them there. I would buy them. They’re cool! Thea: How much is $124, do I have $124? Jeff: These are two very well executed, if not slightly unusual figures. They certainly wont appeal to many of Hot Toys usual fan boy collectors on some of the forums I frequent, but in Hong Kong I can see these going down a storm. There are also plenty of collectors in Europe and the Americas who clamour for anything ‘Disney’ and for them this is a fantastic quality product, well above much of the stuff you’ll find in your local Disney store. 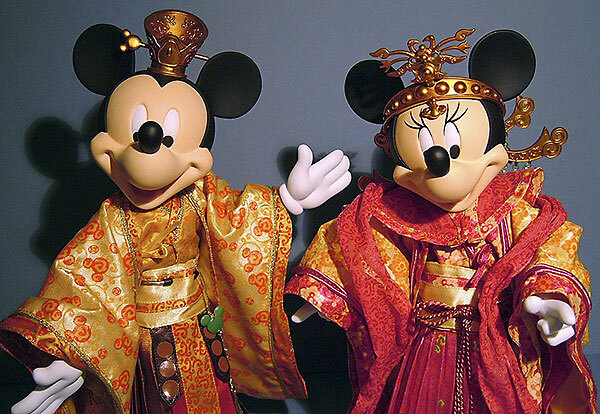 The major selling points are the highly decorative outfits, but while ornate they aren’t from a specific Mickey Mouse cartoon, I’m not sure if that will help or hinder sales, but they are certainly a top quality item. 2009 is the year of the Ox; ‘Home on the Range’ wasn’t one of Disney’s greatest triumphs, so who they’ll give us next year is anybodies guess! Willow: I think they are spectacular and fantastic! They are great dolls to have and my Granny is jealous of me, I’m very proud of them! Or you can use the links on the homepage to check if some of Michael’s sponsors have them in stock.